This conversion is easier than anyone ever makes it out to be. Its actually REALLY easy. Buy a front axle (it bolts into place of the 2wd stuff). Buy a 4x4 trans/tcase. And install! Driveshafts should be easy to find at the junkyard, because you have a longbed. Before you start buying stuff though, consider anything you may want to eventually do to the truck. For example, if you want to lift your truck, install the front axle the same day you do the lift kit. You have to completely remove the front end anyhow when you do the lift. When you buy a transfer case case, consider getting your tcase from a Bronco instead of an f-150. All Bronco tcases are fixed yoke. I'm not sure if you have a 5 speed or an auto, but if you have a 5-speed, try to find a zf-5 from an f250/350, instead of the m5od-r2 out of a F150. Better 1st gear, stronger trans, and still has O/D. And since there are always people who think I'm talkin' out my *** when I say how easy it is.... here is my truck... started as a 2wd, is now a 4x4. Hopefully soon will be 8-lug with 4.10s and a sterling 10.25" rear. I'm looking for a zf-5 speed right now w/ a 205 t-case right now to finish up and do it right. 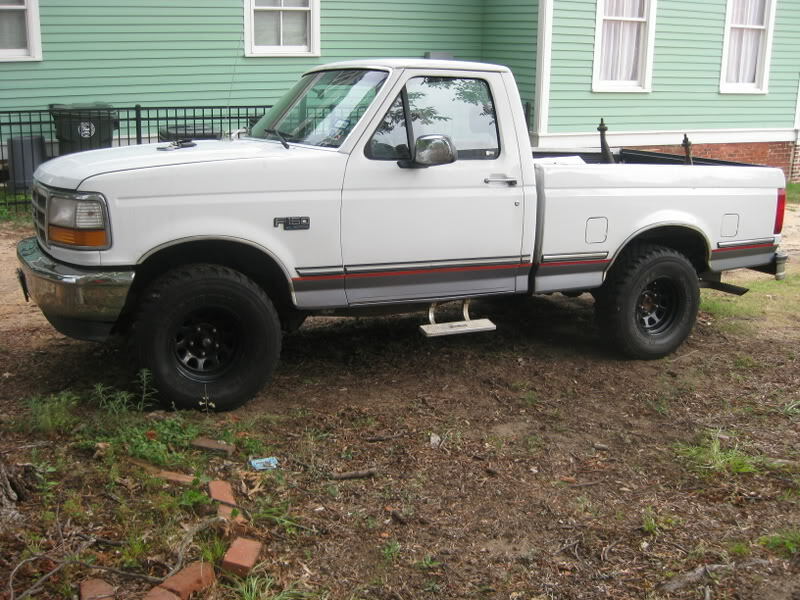 hey man i got a 92 ford 302 aod 2wd. im looking to do this swap as well as swap a 351w in it at the same time. i was planning on buying a donor truck (89 f150 4.9 5 spd 4x4) i already have the motor plannin on just puttin cam lifters roller rocker arms heads intake carb and headers on it and drop it in. my question is will the 5 speed from the f150 hold up to the power of a moderately built 351w? any advice is appreciated thanks. I am converting a 88 bronco to 2wd and will have all the parts you need but I am in Ohio. It is no harder than changing ball joints , piviot bushings or radius arm bushings. Seems like everyone that has no clue how to work on a truck theirselfs make it out to be this long hard process to swap it out. It is 4 nuts and 6 bolts that hold the whole front axle on. 2 radius arm nuts 2 bolts and 2 nuts holding the axles at the pivot on the cross member and the 2 bolts holding the springs to the spring towers. now how hard could it be to take that apart? Last edited by fordtrucknut; 06-28-2011 at 02:54 PM.